Explanation: Knowing when and where to look, many enthusiastic sky gazers have been able to spot the International Space Station (ISS) as a bright star streaking through the twilight. But with a digital camera and a small telescope, recognizable images are possible too. Astronomer Ricardo Borba offers this example of the Space Shuttle Discovery docked with the ISS, recorded this August from his backyard in Ottawa, Canada. Operating a digital video camera on an 8 inch reflecting telescope, Borba tracked the Earth-orbiting pair by hand. Unwanted telescope motion and atmospheric blurring caused most of the video frames to be indistinct, still the single best frame (left) from his video sequence is amazingly sharp. 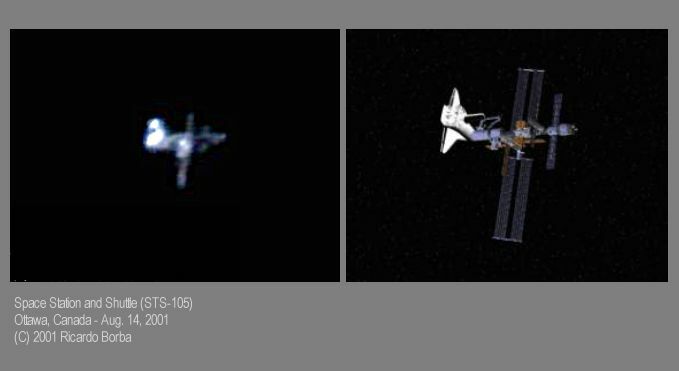 For comparison, he constructed a computer generated image (right) showing the approximate orientation of the Shuttle/ISS docking configuration based on virtual 3D models available on the web.